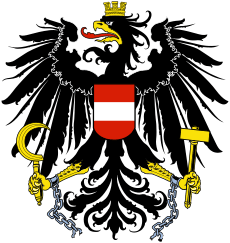 For other pages by this name, see Eagle (disambiguation). Eagles are large birds of prey that are related to hawks and Old World vultures. Eagles hunt during the day and have very good eyesight. The bald eagle is a large eagle from North America that has a bright white head and tail. It is the national bird of the United States and usually eats fish. Eagles are large, powerfully built birds of prey, with heavy heads and beaks. 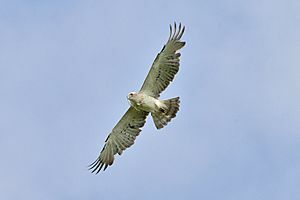 Even the smallest eagles, such as the booted eagle (Aquila pennata), which is comparable in size to a common buzzard (Buteo buteo) or red-tailed hawk (B. jamaicensis), have relatively longer and more evenly broad wings, and more direct, faster flight – despite the reduced size of aerodynamic feathers. 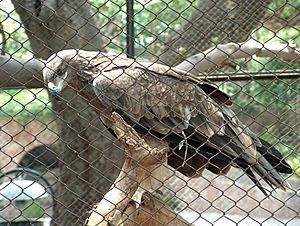 Most eagles are larger than any other raptors apart from some vultures. The smallest species of eagle is the South Nicobar serpent eagle (Spilornis klossi), at 450 g (0.99 lb) and 40 cm (16 in). The largest species are discussed below. Like all birds of prey, eagles have very large, hooked beaks for ripping flesh from their prey, strong, muscular legs, and powerful talons. The beak is typically heavier than that of most other birds of prey. 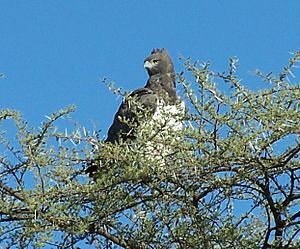 Eagles' eyes are extremely powerful, having up to 3.6 times human acuity for the martial eagle, which enables them to spot potential prey from a very long distance. This keen eyesight is primarily attributed to their extremely large pupils which ensure minimal diffraction (scattering) of the incoming light. The female of all known species of eagles is larger than the male. 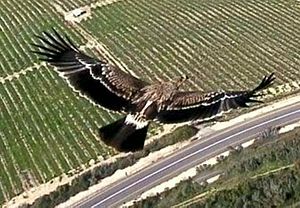 Due to the size and power of many eagle species, they are ranked at the top of the food chain as apex predators in the avian world. The type of prey varies by genus. The Haliaeetus and Ichthyophaga eagles prefer to capture fish, though the species in the former often capture various animals, especially other water birds, and are powerful kleptoparasites of other birds. The snake and serpent eagles of the genera Circaetus, Terathopius, and Spilornis predominantly prey on the great diversity of snakes found in the tropics of Africa and Asia. 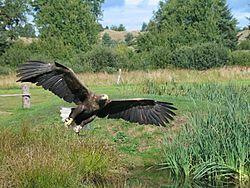 The eagles of the genus Aquila are often the top birds of prey in open habitats, taking almost any medium-sized vertebrate they can catch. Where Aquila eagles are absent, other eagles, such as the buteonine black-chested buzzard-eagle of South America, may assume the position of top raptorial predator in open areas. 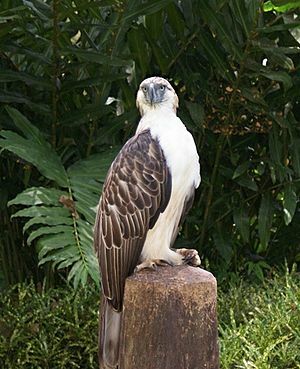 Many other eagles, including the species-rich Spizaetus genus, live predominantly in woodlands and forest. These eagles often target various arboreal or ground-dwelling mammals and birds, which are often unsuspectingly ambushed in such dense, knotty environments. Hunting techniques differ among the species and genera, with some individual eagles having engaged in quite varied techniques based their environment and prey at any given time. Most eagles grab prey without landing and take flight with it, so the prey can be carried to a perch and torn apart. Eagles are often informally divided into four groups. Ancient writers such as Lucan and Pliny the Elder claimed that the eagle was able to look directly at the sun, and that they forced their fledglings to do the same. Those that blinked would be cast from the nest. This belief persisted until the Medieval era. 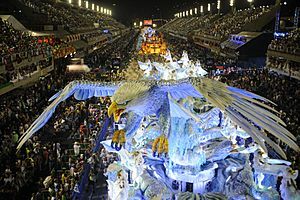 Psalm 103 mentions renewing one's youth "as the eagle". Augustine of Hippo gives a curious explanation of this in his commentary on the Psalms. 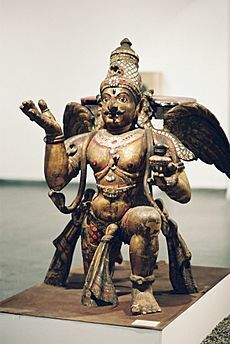 Moses, who spoke on Gods behalf, also expressed that an Eagle is unclean for consumption in Leviticus 11:13. Eagle Facts for Kids. Kiddle Encyclopedia.